Terry Gibson is a researcher and consultant in the field of organisational, community and individual learning and change. His focus is on bridging theory and practice, linking academic insights with action. Most recently he worked for seven years as a director of the Global Network for Disaster Reduction, focusing particularly on the development of the innovative ‘Frontline’ programme which gathers and shares knowledge and experience from local communities across the globe to drive change locally and nationally. During that time he also completed a doctorate at Manchester University titled ‘Horizontal Learning and Social Media in an International Development Network’ and continues to link action and research in his work with organisations and groups. 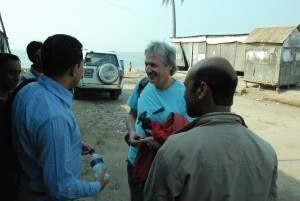 He previously established a specialist company ‘Media4change’ (now part of the Anthesis group) which applied his earlier work in communications and media to change processes in international development and in corporate social responsibility, working for clients ranging from SAB Miller to Tearfund. In earlier work he produced documentary films about development and humanitarian change for both not-for-profit and corporate organisations over the period 1990-2005, working in over 35 countries, and has also produced several broadcast programmes.